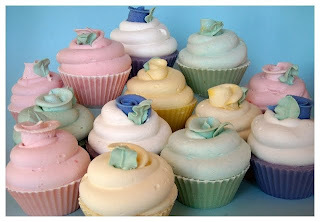 Odette Handly is the owner of Riverlea Soap and makes these realistic and adorable cupcake soaps. I love ’em to pieces! Anne-Marie: How long have you been making soap? Odette: I am self taught but have only been making for about 3 years. I studied Fashion design and worked as a fashion buyer and then worked for myself making wedding dresses and ball gowns. But I broke my vertebra in my lower back and was told by the surgeon that I would be unable to sit for long periods of time. The recovery time for a back operation is LONG. This is a problem if you sew. I then needed a backup plan to make money after the operation. Something I could do standing up – I found a book that my sister had bought me on making soap and that was the beginning. I have not looked back. Every day brings something new with exciting ideas. Anne-Marie: Your cupcake soap is incredible! What’s your top selling flavor of cupcake soap? Odette: Pink floral outsells anything else by far with Lavender a close second. Anne-Marie: What is your number one business goal for the remainder of 2010? Odette: To improve sales/exposure in Johannesburg and Cape Town – the two biggest cities in South Africa. I have just recently started selling there and I need to concentrate more on those areas. Anne-Marie: Thanks Odette and keep up the good work! Check out Odette’s blog HERE and buy some of her Soaps HERE. My daughter lives in Swakopmund, Namibia facing the ocean and the sand dunes. It was incredible and I loved it. I flew into Johannasburg then to Windhoek. I would love to come back. Your soap is so beautiful!! I told her about you and your soap. Hopefully she can find some. I admire the beautiful job that you are doing!! Hi there Where did you travel to in Africa? I hope you had a great time and loved the country. The computer thing is a challenge but we would be bored if we did not try new things. There are also a lot o very helpful people out there to offer advice. Thank you Anne-Marie. You are the greatest!! amazing,too. You have helped me so much. I continue to move forward and am loving this wonderful world of artisan soapmaking. I don’t think the recipe is shared but you can always check out Nizzy’s for a whipped soap recipe. These are adorable. Is the recipe shared? I am so impressed that you are doing the whole computer thing yourself!! I really struggle with it, too. You are doing a fantastic job!! I was in Africa for a month visiting my daughter and came hope amazed at the incredible talent in Africa. I Love those soaps!!! I would love to know how the “frosting” is made. How can I find out? Thanks. I really love those soaps!! Do you know how that “frosting” is made? Or where I can find out. The packaging is so cool. I’m betting Firefly is telling me that since I just took the blog links to favorite blogs I am reading away from the site! =) Not to worry Odette, I don’t think you’re missing anything at all. Wekk done Odette, you make us Handley’s a proud bunch. Hey there firefly. Odie from Riverela Soap here. Help please your comment is interesting but I am thick so I need an explanation. Ps I am new to the blog thing and web site. I do it all myself and have no-one to help so I sometimes know that I need to update and do things on the site and blog but don’t always get to it right away. So pretty! The cupcakes make me hungry. Maybe you should add a link on your sidebar that goes to a new page of your blog that has your favorites? (long sentence!) It would take up less space than a bunch of links in the sidebar. They do look like little pieces of cake. Well done! Those are beautiful. Love the flowers on top too. These are adorable, and look like such fun!